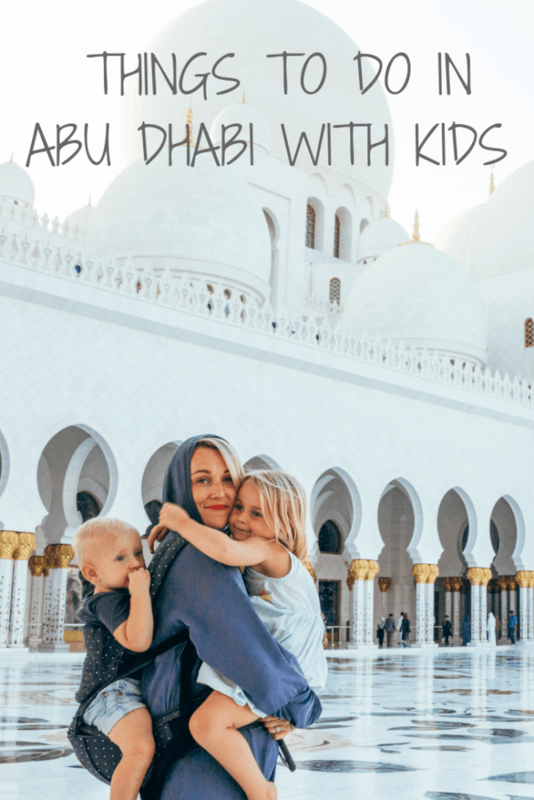 We were visiting Dubai and felt we really couldn’t miss out on Abu Dhabi with kids. At only an hours drive from Dubai and direct flights from London to Abu Dhabi itself, the city of glitz and glam with stunning beaches is more than accessible. Based on an island extending from the mainland into the Arabian gulf, it’s no surprise the beaches are stunning. The skyline is dominated by skyscraper buildings with some unusual architectural design. 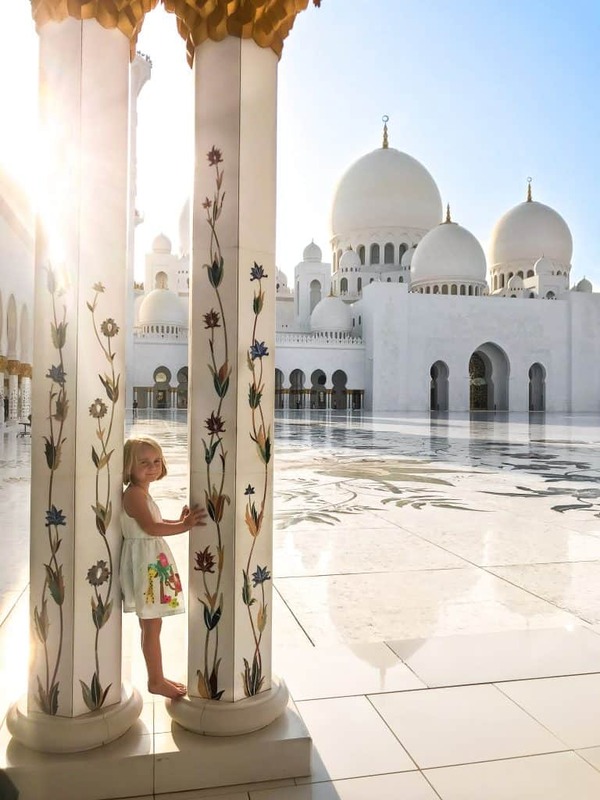 Being the capital of the United Arab Emirates, it’s no doubt the city has some incredible landmarks such as the Sheikh Zayed Grand Mosque and Emirates Palace. We spent four days exploring Abu Dhabi with kids but in truth, a week is probably a good amount of time to see and do all the highlights at leisure. 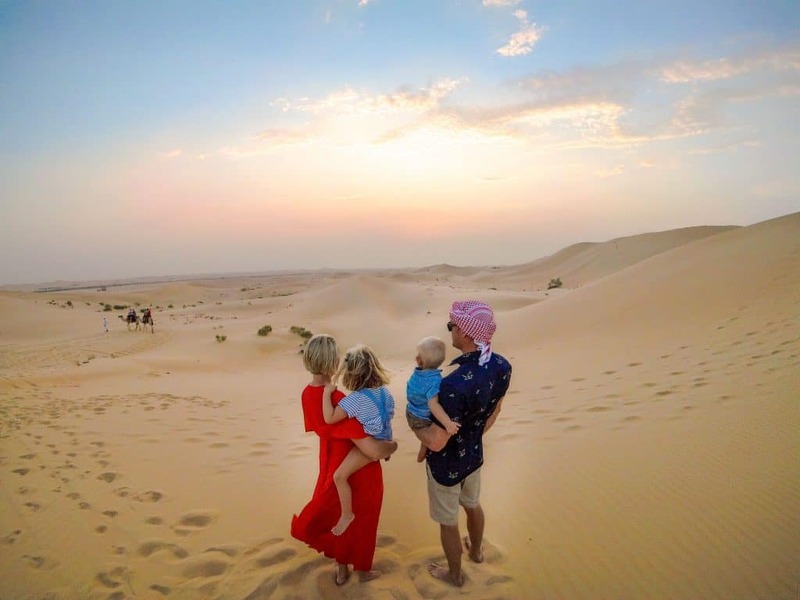 We’ve had a little help from our friends to put this itinerary together due to our limited time in Abu Dhabi, we didn’t want to miss out on the best things! 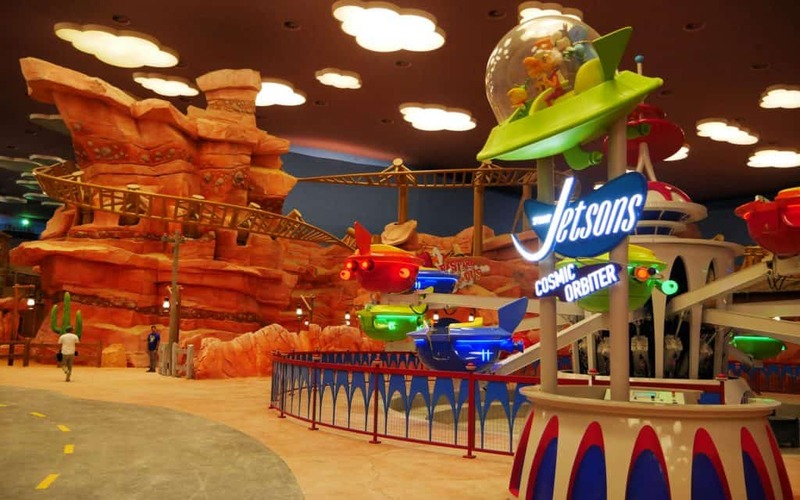 The latest entertainment sensation to hit Abu Dhabi is family theme park Warner Bros World. Based in the city’s entertainment zone of Yas Island – only minutes from the Abu Dhabi International Airport – you will find this entirely indoor entertainment complex. Made up of two halves, the park is divided into the Heroes & Villains of Metropolis and Gotham City on one side, and Warner Bros classic cartoon characters on the other. Whilst rides do make up a big part of the theme park, there’s no shortage of interactive entertainment, shows and character meet and greets to keep the kids entertained. The park is ideal for children over 110cm, though there is still a good variety of rides that younger children can get involved with. Stand out favourites so far (and if you are visiting on a busy day, run to these first!) include The Riddler’s Revolution, Tom & Jerry’s Swiss Cheese Spin and Fast & Furry-ous in Dynamite Gulch. From the minute the park opens with a Cinema Spectacular light and sound show in Warner Bros Plaza, the park is abuzz with excitement. The attention to detail is exceptional and the characters really know how to make the children feel special. Top tip: Visit during local school term time you can almost guarantee you’ll get no queues for rides and the park to yourself during the day! The Emirates Palace of Abu Dhabi is opulence defined. It is a grand and sprawling building where simply no expense has been spared. Everything oozes extravagance and gold is the dominant colour signifying the wealth invested in the construction and endless finishing touches. Many of that being actual gold itself! 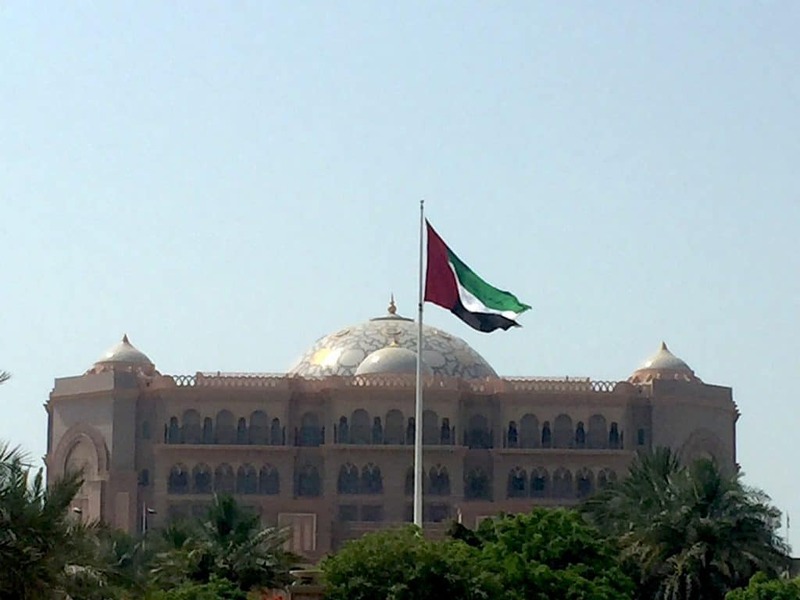 Commissioned by UAE founder Sheikh Sayad, the Emirates Palace was designed to have joint meetings of the 7 United Arab Emirates. Sayad was instrumental in unifying the 7 previously separate Emirates to form the UAE and had the vision to become stronger together and maximise return on the oil reserves that have brought wealth and prosperity to the land. The Emirates Palace is still in use today for such purposes but also as a somewhat pricey hotel option and popular for the mega rich to host all manner of weddings and salubrious gatherings. As a visitor, you are free to wander the sprawling lobby and look over the many gardens or even grab lunch. Once upon a time there was a gold bar vending machine in the foyer, although this has since been removed due to a dispute in its weighing accuracy! The standard Abu Dhabi dress code applies of covered arms and legs for men and women. Stretching out over 8 kilometres, the Corniche is Abu Dhabi’s main beach front and a hub of social activity for Abu Dhabi. Over the years many sections have been developed to include family beaches, palm tree-lined pedestrian walkways, change facilities, restaurants and life guard stations. 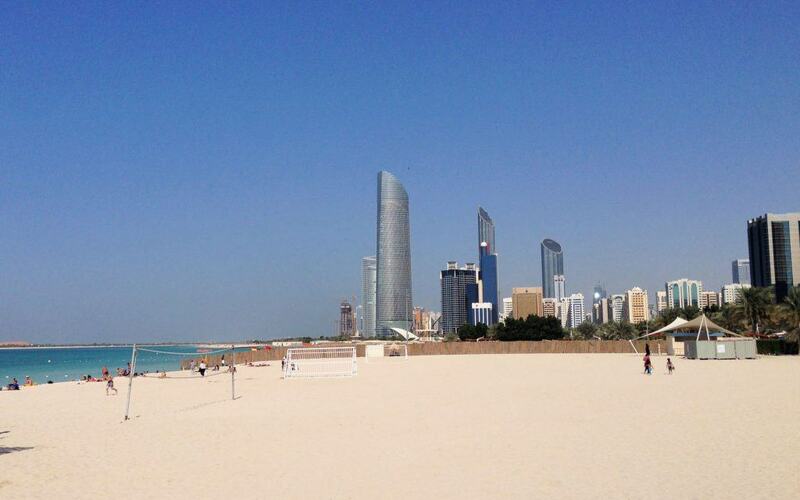 You can enjoy the Corniche in many ways, both from the beach and in the water. At the high end of the scale, you can try a day pass to one of the luxury resorts – the Hiltonia or Nation Riviera – for deck chair comfort, drinks service and nearby pools; or do as most do and join from the public beach at the end of 30th street. All sections where swimming is allowed have lifeguards on duty during daylight hours (swimming is prohibited at night). One small section is fenced off for families only to enjoy with a very small entry fee, this includes a grassed lawn and picnic area. The latest addition to the Corniche is an area called A’l Bahar. 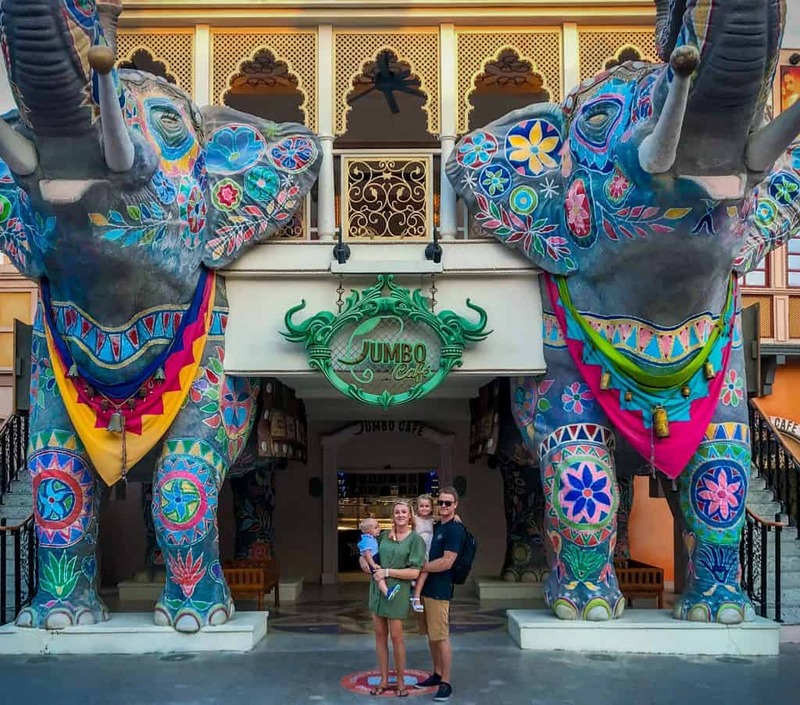 It is designed as a family entertainment zone and includes Aqua Fun – an inflatable obstacle course on the water spelling out I Love AD – as well as a giant kid’s playground (free) and many paid activities including ropes courses and arcade style games and eateries. On the weekends there’s also roving live entertainment and it’s a popular spot for fitness fanatics to work out and play basketball. All along the Corniche there is a pedestrian path as well as a bike path. Hiring bikes is a popular past time. The main hire point is at the start of the Corniche near the Hiltonia but there are also rental stations along the beachfront, the perfect evening activity in the cooler winter months. variety of restaurants to have lunch or dinner. Although Abu Dhabi is a dry country, these restaurants do serve alcoholic drinks for the parents. The marina is a great place to spend the day. 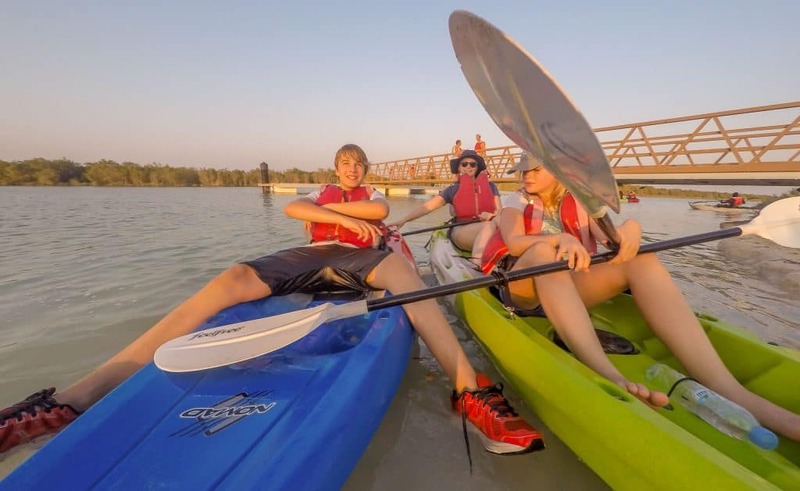 An Abu Dhabi mangroves Kayak trip can be from an hour to half a day, it just depends how much time you spend exploring the mangrove forest. The Mangrove National Park is over 70 square kilometers and home to several endangered species including sea turtles and dolphins. If you’re lucky you can spot some and this will keep kids busy looking out for them. The easiest tour takes you into one of the mangrove channels were at a small “beach” you can go on the land (at low tide) to see the mangroves up close. Make sure to check out the small holes in the sand where crabs live. It’s a peaceful area as the city noise is gone but skyscrapers tower above the forest kilometers away. Kayaking these mangroves is a great way for kids to learn about this unique eco-system and its inhabitants. Make sure to add it to your Abu Dhabi itinerary. Dubai Parks and Resorts are exactly halfway between Abu Dhabi and Dubai. At only around 30 minutes drive, the fun-filled attraction is more than accessible. The area has several theme parks, namely Legoland, Motion Gate and Bollywood. It takes a couple of days to do all of them with little ones but it is possible to do all three in one day with older kids if planned well. We loved the Legoland Waterpark. It was such a fun filled day and had something for all of us, even our one year old enjoyed the experience. Bollywood was my favourite of all, most probably because its something different. It’s the perfect activity at around sunset time. The experience is predominantly theatre performances which both of our children really loved. The park does an amazing job at setting up a mock Taj Mahal, Mumbai train station amongst other Indian scenes. Sheikh Zayed Mosque is a stunning architectural masterpiece. Move over Taj Mahal, you have a competitor! 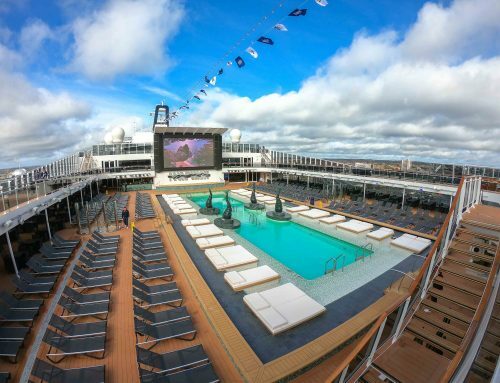 The white marble wonder of the world hits many records. The largest chandelier in the world, the largest carpet in the world. The inner courtyard is completely empty allowing stunning uninterrupted views of the mosque in its entirety from every angle. The colonnade corridors around the perimeter with tall columns are beautifully crafted with intricate design. We visited close to sunset, seeing the mosque in a variety of lights made it look completely different. It wasn’t at all crowded making it a relaxing and enjoyable walk around the Sheikh Zayed Mosque. Our kids loved exploring. It’s worth noting, the mosque is the epicentre of local traditions and customs. Female visitors are expected to wear an abaya and cover their hair. They provide them for free on entering, men are equally advised to dress conservatively. You cannot be seen taking pictures outside or near the mosque without your hair covered. Officials will ask you to delete it from your phone. We spent an evening in the stunning Abu Dhabi desert, our hotel arranged the trip for us. We were collected in a big 4×4 at around 3pm and the drive to the desert took about 45 minutes. I have been asked so many times about how it worked with the kids and I have to admit it was totally fine. They provided car seats for the little ones and they dropped us off at the camp whilst they took some of the other adult guests dune bashing. It was amazing to hang out at the camp without the rest of the group for an hour. My husband had a chance to sand board on the dunes next to camp, the kids had henna painting and tried on the local abaya and traditional clothing. Although, if you are wary of animals involved in tourism, it’s worth noting there are camels and eagles at most of the camps. Once the group arrived back from the dune bashing, the sun was beginning to set and we were served a buffet dinner. There were options for vegetarians / vegans- yay, and the kids found a few things they liked too. After we had dinner there was some amazing dance performances that lasted about an hour. We were home by 9:30 pm, although it was a little late for our kids, the experience was totally worth it considering how much they enjoyed it. My fellow blogger Nisbah kids are real adrenaline junkies, so Ferrari World Abu Dhabi was top of their little Adventurers wish list for our Abu Dhabi adventure. Here is what Nisbah had to say: Ferrari World is home to the world’s fastest roller coaster and from the joyous screams of both my daughter and husband as the disembarked from the ride, the accolade was well deserved. 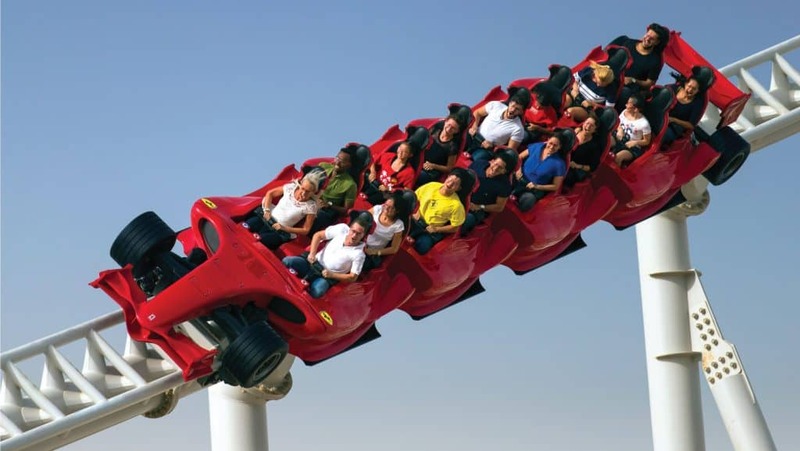 Ferrari world is not a conventional theme park and isn’t filled with endless ride options. Where the park exceeds is the few roller coasters that it is home to are some amazing rides and for adrenaline junkies, it will be a huge hit. There is also lots of Ferrari’s to be wowed by, plus interactive shows, soft play options and rides. There are also a few additional extras such as go-karting which need to be paid for. For families with young children, I wouldn’t recommend the park for children under 110cm. For children, over 110cm there is lots of options, they need to be over 130cm to sit on the roller coasters but there is plenty of options and our youngest could go on plenty of rides. We visited in October and on Friday and were amazed on how many rides we managed in just a few hours. That is my biggest pet peeve of these parks when big rides take several hours. The queues for the park were ideal and we hardly waited at all which allowed us to do some of the children’s favourite rides several times! Overall a great day out for families especially those with teens who love adrenaline filled activities. Yas Waterworld is a favourite with Abu Dhabi residents and visitors alike. Situated in the heart of Yas Island, it’s really close the airport if you are just looking to fill a layover, or surrounded by many hotels and restaurants so you can make a complete trip out of your water park experience (you can get some amazing hotel/theme park combo packages!). 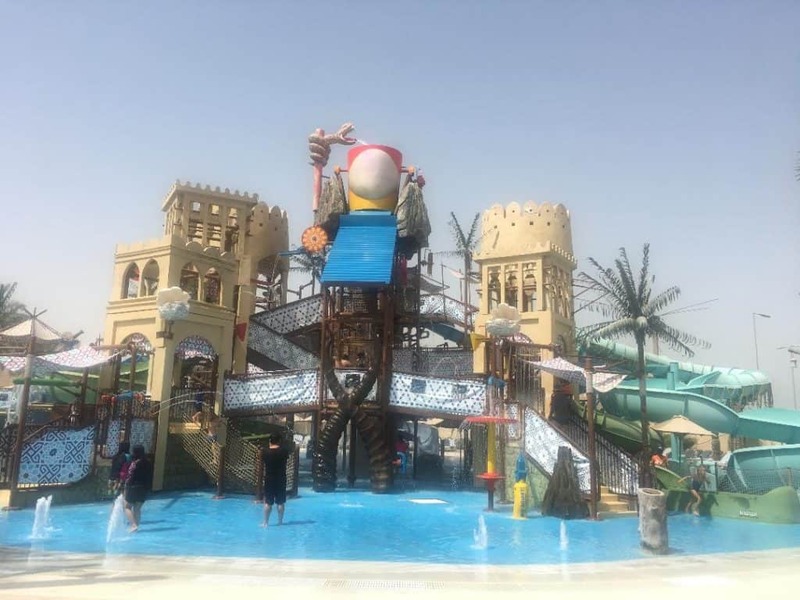 What makes Yas Waterworld so special is that its got something suitable for all ages so it really is a family experience. From easy slides and splash play areas designed for the littlest toddlers through to tweens. Then there are plenty of adrenaline-pumping rides and slides for your much bigger kids to enjoy! The park is well laid out, keeping a traditional Emirati theme to it. 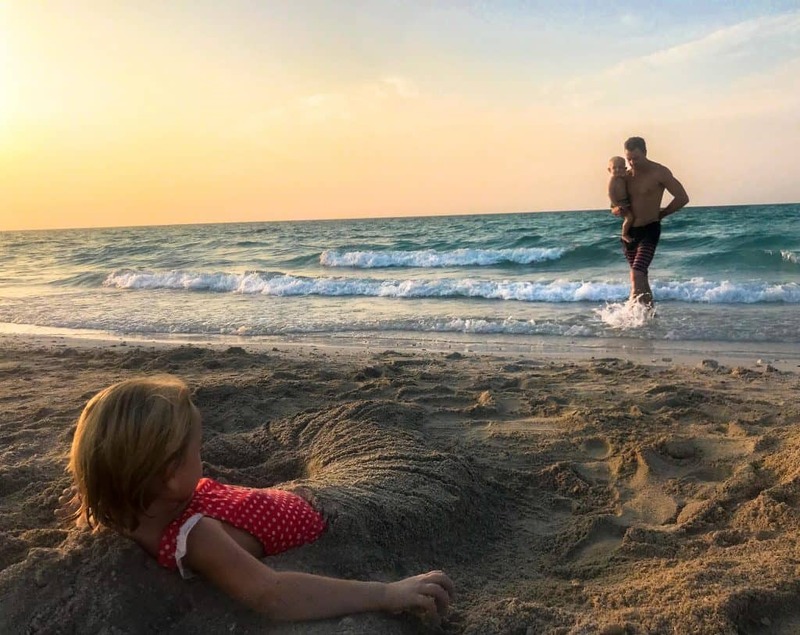 They have add-on experiences such as pearl diving and a mermaid school, the brand new Cinesplash water cinema, or enjoy the plentiful lounge chairs around the park. They offer everything from towel hire to swimming costumes so it is possible to literally pop out of the airport for a few hours and enjoy a cooling experience. Like anywhere in the UAE weekends (Friday & Saturday) can be busy and queuing expected from lunchtime onwards, but weekdays you can expect pretty limitless rides. Even in the peak of summer, the water is chilled so you will find it a refreshing stop on your Abu Dhabi itinerary. We spent four nights in one of Abu Dhabi’s newest and swankiest hotels, the Saadiyat Rotana Resort & Villas! Saadiyat Island is one of the most amazing parts of Abu Dhabi with its lush tropical beaches, white sand and aqua blue clear water. 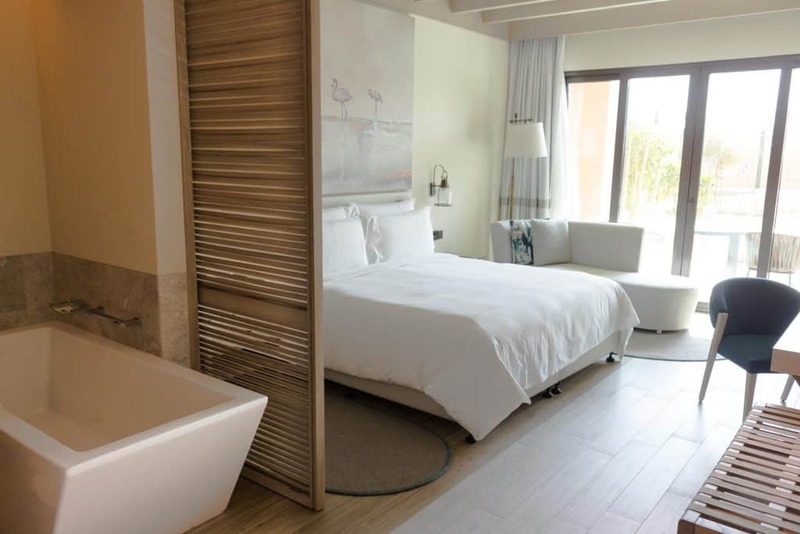 Saadiyat Rotana is a five star resort with some really impressive mod cons. Just walking into our bedroom automated the curtains being opened, we were super impressed with the advanced technology. The rooms are seriously stunning when it comes to interior design. The beds are incredibly comfortable and they have a clever conjoining room setup, so parents can get some down time in the evenings. There are quite a few restaurants onsite and they offer a really nice half board option which is perfect for the lazy beach holiday. We generally ate lunch whilst site seeing in the morning and ate dinner back at the hotel. They had everything from a lovely Italian to a really posh English pub onsite. Now here is quite the statement, but Saadiyat Rotana serves up my husbands favourite hotel breakfast of all time. Breakfast is our favourite meal of the day and without bragging we are quite the connoisseur having stayed in 150+ hotels over the last year. They had an entire station dedicated to amazing fresh juices, local delicacies, amazing pastries, just about anything, the quality was second to none. 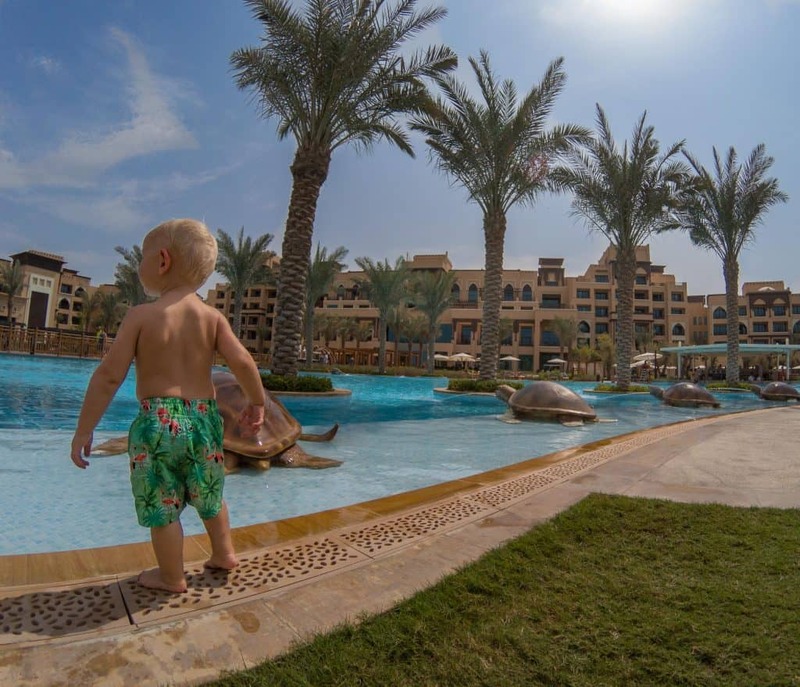 When it comes to visiting Abu Dhabi with kids, Saadiyat Rotana is ideal for families looking for luxury but also catering to little ones. There are not many hotels that manage to pull both luxury and family friendliness off but Saadiyat Rotana do it perfectly. We found there were more families than not at Saadiyat Rotana. 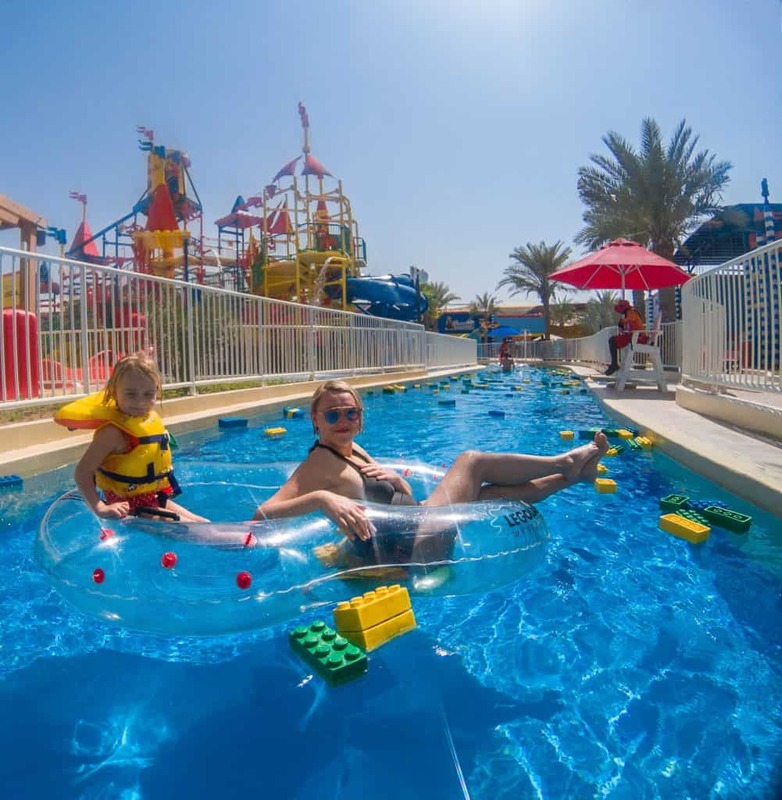 They have a gorgeous kids club called ‘Aladdins Cave’ that has its very own splash pool, lovely staff that facilitate some great activities and a big room to watch movies! Our little one loved going but often struggled with the decision whether to go to Aladdin Cave, the pool or the beach?! The huge pool in the centre of the resort is the ideal depth for kids. It’s surrounded by giant palm trees and some beautiful turtle statues. The beach in front of the resort is a turtle preservation area as they often come in to lay eggs between June and September. 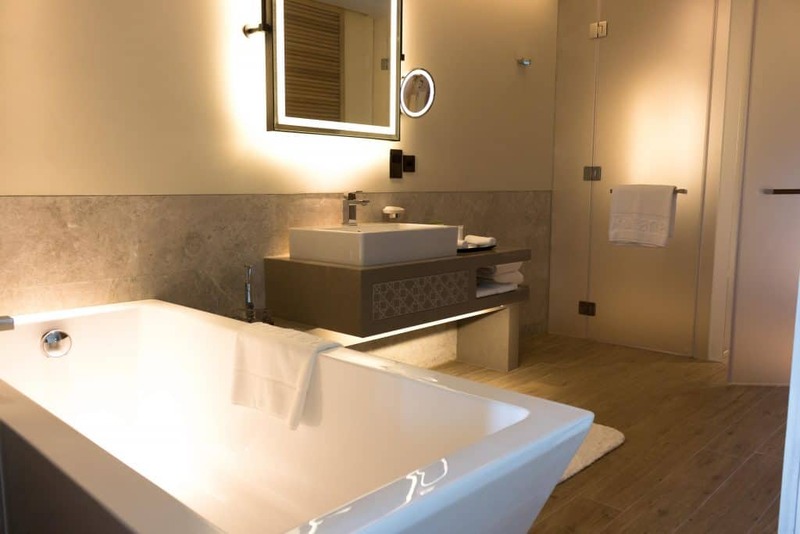 Saadiyat Rotana have taken many of the natural elements from the surrounding area and incorporated it into the design and architecture of the building. In the reception area there are different sands from all the different deserts around UAE under a glass floor. It’s a super beautiful feature and very eye catching as you enter. Talking of beautiful things, the beach is just gorgeous. We spent some lovely evening’s swimming and catching the sunset. The water is so warm, almost like a bath and apparently it’s not uncommon to see dolphins passing by. There is a gorgeous beach bar, complete with swings for the kids to play whilst relaxing with a cocktail. It was an all round amazing stay and I know we would definitely go back when we travel to Abu Dhabi next. Our stay at Saadiyat Rotana was complimentary in return for an honest review. As always, all views expressed are entirely my own. Do you remember the name of the tour group that took you in your desert experience with children?